Pals, Kathryn, Paul and their family! 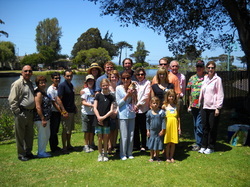 Pals of all ages gathered at Lake El Estero in Monterey CA for a picnic afternoon of games, paddle boat rides, good conversations and laughter! Pal members including patients, spouses, family caregivers, newly diagnosed, cancer free cancer survivors, singles, couples, with kids, without kids, grandkids in other words ALL Pals, will gather at Lake El Estero to celebrate Father's Day and Pals' Family Fun Day! 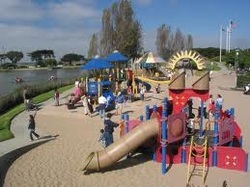 We'll enjoy a casual picnic lunch, play time at Dennis the Menace park for the little ones, paddle boat rides on Lake El Estero, and family games filled good-natured competition and camaraderie! 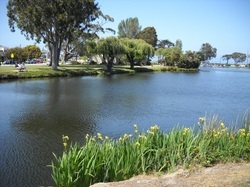 Serene and sunny, Lake El Estero is the perfect spot for a picnic! We saved a place for YOU at the picnic tables! 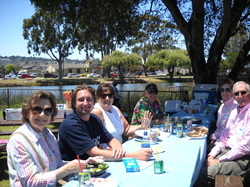 Pals gather to share a picnic lunch along Lake El Estero! Bring your family to join in the festivities! 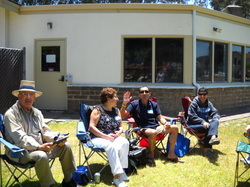 We all share smiles, good food, laughter and conversation! Fun for all ages at the Pals' Family Fun Day! The youngest "Pals" enjoy the rides, while the 'tweens navigate paddle boats on the lake! We'll save space for YOU at our Family Fun Day party! Thank you to our Pal, Dennis, for sponsoring this page! Copyright by PMP Pals' Network/All rights reserved. We have HOPE for YOU!